Recently, the name Bastian Oczipka has been mentioned as a target for Paolo Di Canio’s Sunderland A.F.C. during the 2013 summer transfer window. The German left-back has seen his stock rise eight-fold since his 500,000 euro transfer to Bundesliga side Eintracht Frankfurt prior to their successful 2012-2013 season, finishing third in the running for best in his position in the Bundesliga for 2012-2013, and yet he remains a highly undervalued potential target at only 4,000,000 euros. Eintracht Frankfurt shone for great stretches of the 2012-2013 campaign, eventually ending the season in sixth place: a place good enough to qualify for a Europa League spot. However this was a result that was far beyond the estimations of even the most hopeful punters. The starting team was built with a combination of academy graduates and intelligent transfers, with the most expensive purchase being Germany youth international goalkeeper, Kevin Trapp for the princely sum of 1,500,000 euros. Yet despite the relative unknown quantities of his team mates, Oczipka rarely received the plaudits he deserved. Those instead went to the likes of Takashi Inui, Sebastian Rode, Sebastian Jung, and the aforementioned Trapp. Nonetheless, through a simple statistical analysis it is shown that there is more to Bastian Oczipka than meets the eye. Bastian Oczipka was born on January 12, 1989 in Bergisch Gladbach, in what was then West Germany. 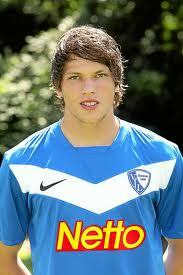 He joined local club SV Blau-Weiß-Hand at the age of five, only to transfer to SSG Bergisch Gladbach two years later. Another two years passed, and in 1999 a ten-year old Oczipka was accepted into the Bayer Leverkusen youth football academy. There, he moved up the ranks, and won the U-19 Bundesliga in 2007, scoring in the final against a Bayern München side containing the likes of future German internationals Holger Badstuber, Thomas Müller, and Toni Kroos. Upon Oczipka’s graduation from the Bayer Leverkusen academy, he was sent on loan to Hansa Rostock for the 2008-2009 season in the 2. Bundesliga. At Hansa Rostock, Oczipka made 42 appearances, assisting 4 goals. However, halfway through the 2009-2010 2. Bundesliga season, Oczipka was recalled by Bayer Leverkusen, who subsequently sent him out on loan to FC St. Pauli. At St. Pauli, Oczipka helped the team gain promotion to the Bundesliga for the 2010-2011 season, for which he remained at St. Pauli. In all, Oczipka appeared 36 times for St. Pauli, scoring one goal and assisting six others, but was unable to prevent the club from being relegated, largely due to an ankle injury suffered in February of 2011. Despite his ankle injury causing him to miss the final fourteen match days of the 2010-2011 season, Oczipka impressed enough to be recalled to the senior Bayer Leverkusen squad prior to the 2011-2012 campaign. However, Oczipka was never able to fully recover from his injury at Bayer Leverkusen, as he missed all of pre-season and, when healthy, was often passed over in favor of Michal Kadlec, now of Fenerbahçe S.K. Ultimately Oczipka made a mere nine Bundesliga appearances during the 2011-2012 season, starting only once, before gladly accepting a transfer to newly promoted Eintracht Frankfurt. A simple observation led to a comparison of statistics, which in turn led to a starting realization: Bastian Oczipka is performing in a nearly identical manner to Fábio Coentrão circa 2009-2010, a period shortly before Coentrão was voted the Portuguese League Breakthrough Player. When observing both players in action, the similarities are remarkable. Both players play as left-sided wing backs, overlapping regularly and more comfortable supporting the forward progression of play without neglecting their defensive duties. Both players are left-footed and comfortable crossers of the ball, as witnessed during both S.L. Benfica‘s successful 2009-2010 season as well as Eintracht Frankfurt’s 2012-2013 season. In addition, when either Fábio Coentrão or Bastian Oczipka made an assist in the 2009-2010 Primeira Liga or 2012-2013 Bundesliga, respectively, their teams did not lose. The similarities are quite amazing. If these statistics are supplemented by their market value trends, it is apparent that the two most observable differences between are the relative ages at the time of the breakthrough (24 for Oczipka v. 22 for Coentrão) and the injury suffered by Oczipka in 2011. Regardless, Oczipka is obviously undervalued at 4,000,000 euros, when Coentrão’s market value at a comparative time period was 5,600,000 euros. So, why would a club such as Sunderland A.F.C. be in the market for a player like Oczipka? A more appropriate question may be why aren’t more clubs looking at a player who has the attributes and talent of Coentrão but at a fraction of the price. Tagged Bastian Oczipka, Bundesliga, Coentrão, Eintracht Frankfurt, Fábio Coentrão, Oczipka, Player Profile, Scouting Report, Sunderland, Sunderland A.F.C. Listed at only 1.87 m long, this young German attacking midfielder is already causing heads to turn whenever he comes on the pitch with his powerful long distance shots. He has yet to really break into the national team, but with a country loaded with young talents, it will, undoubtedly, take some time before he is a regular fixture in the national team. Draxler made his debut for Schalke on January 15th, 2011. At this time, he was the fourth youngest player to make his debut in the Bundesliga. The following week he, he made his debut start for the German side against making him the second youngest to ever start in the Bundesliga behind Nuri Şahin. He appeared in 30 of the 34 matches that helped Schalke get into the Champions League. Draxler made his debut on the international side for the German U-21 scoring a goal on his debut in a 4-1 victory over Cyprus U-21 in a qualifier for the 2013 European U-21 Championship. He made his debut for the national side, in a loss to Switzerland, less than a year later than that. He can score goals with both his left foot and his right, while hitting them from some distance. Draxler is very gifted at reading the game; he usually makes the right pass at the right time. Another outstanding feature of his is his ability to hold onto possession for long periods of time, similar to that of the Argentinian superman Lionel Messi. Perhaps his weakest ability is crossing the ball into the box, but that will surely get better as he ages and his game develops more.